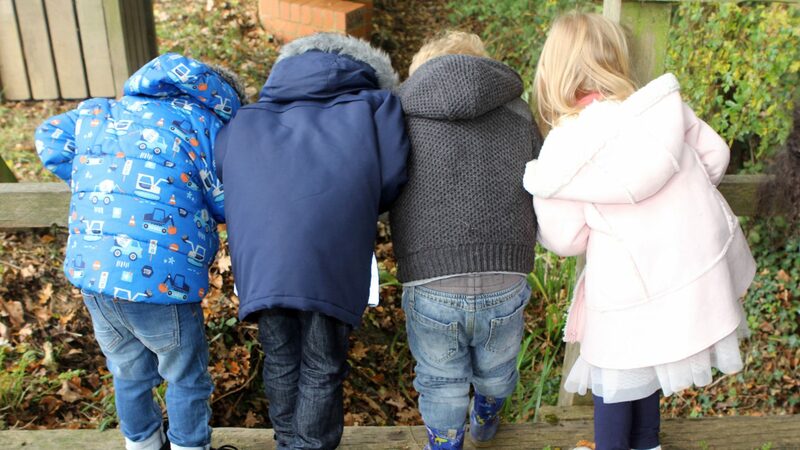 Our West End Farm Woodland School in Burgess Hill is designed to enrich the children’s experience of nature using the FOREST SCHOOL approach- whether they attend for full day care, nursery, pre-school or just hourly day care. The outlook on the one side of the nursery setting is an enormous open field where the children can run and run and run- and on the other side, there is a wonderful forest setting that has been constructed in such a manner that the children can play in the forest safely. The setting is equipped with resources to suit all age groups from babies and toddlers to pre-schoolers. We are registered for up to 25 children with ages from birth to 5 years old. 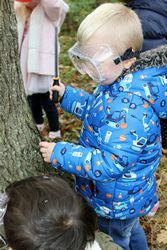 At Norto5 KIDZ in Burgess Hill, we offer a forest school approach to the setting where children can explore tool work, nature and learn other life long skills. 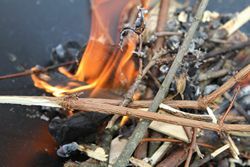 This includes activities where they can make dens out of natural resources, can learn how to light fires and how to build using materials from the forest. 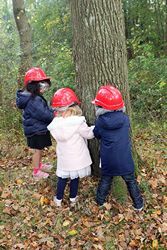 The Forest schools philosophy believe children should have regular sessions that are between two and four hours in duration that they can become engrossed in play. 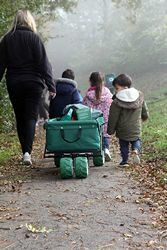 This would be supervised by a practitioner trained in the Forest Schools philosophies who will influence child-led play based on their interests. 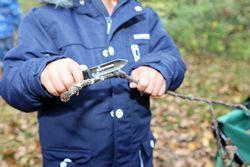 The children themselves will learn how to develop and manage risk as they use forest tools whilst being closely monitored by their practitioners. 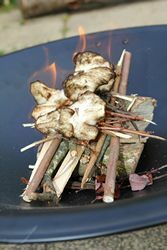 The children will learn how to track using sticks and stones, how to make charcoal, how to do leaf printing and other creative activities. Through the Forest school approach, children develop in every aspect of learning which helps to evolve their confidence and self esteem and give them an insight of how to take care of the forest and natural environment. 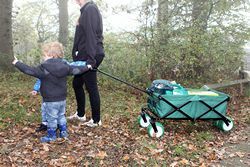 Forest schools aim to provide children with experiences and skills to understand the world and care/respect the world around them as well as their peers. We strongly focus on child-led activities allowing the children to develop their interests. We make sure that they have rich and interesting environments both inside and outside where they can explore and find exciting opportunities to increase their physical and mental capabilities. Child led activities looks closely at how to extend and expand their experiences by observation and planning their next steps. Adult led activities take place where the practitioner will plan an activity, encourage and develop the children’s abilities by talking them through the process and encouraging them to cooperate with each other to produce their own work. The children are allowed to flow freely between the indoor and outdoor activities giving them the choice of different environments. The construction area has a bench with tools together with different natural resources and loose parts to build with. They have the opportunity to construct objects using planks, tyres, guttering as well as different shapes of wood and blocks. All these items encourages the children to use their imagination and to develop their fine and gross motor skills. The reading den gives the children a place to sit quietly and read a book and to play with puppets or to just unwind. The home corner is rich with different resources and fresh food for the children to again explore their senses and to develop an understanding of play through their imagination. 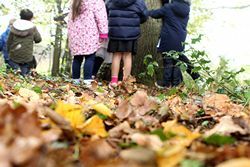 We are fortunate to have a wonderful woodland adjoining our setting where the children can safely experience and appreciate nature in all it’s wonder. They can feel and touch nature in all it’s splendor. Our forest program enables children to explore and respect nature, take risks and succeed. Perhaps today they will be asked to collect firewood for a fire then we use the fire to make pancakes. An experience comes to mind.. a little while ago, one child picked up the end of a large log and quietly began dragging it along the forest floor. one of his friends saw him struggling and ran over to help him.. then another and yet another child until there was a team of children quietly discussing how to navigate around the trees then they all dragged the log across to the circle where the rest of the children were having a group discussion. There were many lessons learned that day! 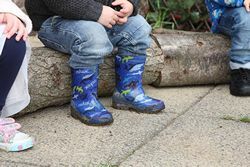 Children are exploring their play by using mud and other natural resources which enables them to use their imagination skills and their senses. They explore the difference between dry and wet mud by placing their hands in it, making prints and squashing the mud down into the sink. The sensory feel, smell and look gives the children an insight into natural play. Other resources like straw, grass, flower petals, vegetables, fruit, fresh herbs can be incorporated into their play which stimulates the brain and is important for the child’s learning through play. In contrast to giving children plastic fruit to play with, they have the opportunity to break open and explore the insides of vegetables. This develops the child’s enquiring mind improving their brain development and insight into real life. We play outside in all weathers. We have a planting area where the children can plant seeds and grow their own vegetables and flowers. The children have many natural resources that they can use to play with outside and we feel that if the children have a rich environment to play in, they are happy. Inside the setting, we have a natural room which accentuates the aspect of natural resources, giving them the opportunity to use their senses of touch, feel and smell. It allows children the chance to express themselves freely and expand their play and are not restricted by the pre-set limitations of objects or plastic items. For example wooden blocks can be used to build a multitude of things, a house, a car, a bridge, a tower, the natural resources allow a better feel and texture and loose parts enable the children to develop their play in so many ways. If you have any questions or would like to arrange a visit please give us a call or use the contact us page.